For the self-confessed Kini fan. The hoody Renzo is a casual traditional jacket through and through. 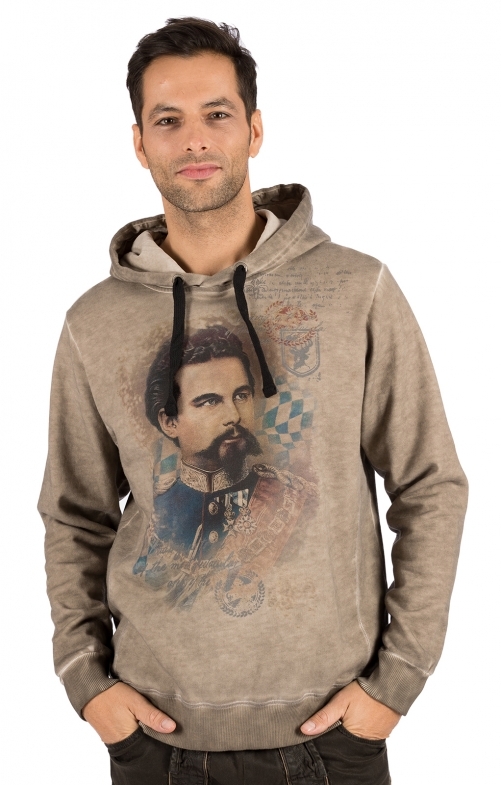 This used-look sweater in beige features the youthful portrait of Ludwig II on the obverse, affectionately known by the Alpine people as "the Kini". Bavarian diamonds identify him as King of Bavaria. Yellowed manuscripts and stamps on the front and back underline the retro style. Elastic cuffs and the solid drawstring for the hood keep you warm even in stormy weather. Super Qualität! Sehr schnelle Lieferung! Wieder eine Glanzleistung von ALPENCLASSICS.